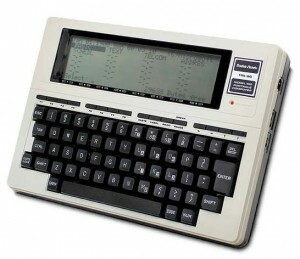 Radio Shack introduces the TRS-80 Model 100, one of the first portable computers in a notebook-style form factor. The portability, simplicity, and built-in modem of the Model 100 made it very popular with journalists who could write stories in the field and transmit them back to their offices. Incidentally, in the early 90’s I acquired a Model 100 that had been used by a newspaper. I was able to use it to code simple programs, write papers, and use the modem to connect to bulletin board systems of the time. I recently found that I have 2 of these models among my tech junk – still in good working order! Good times, good times.